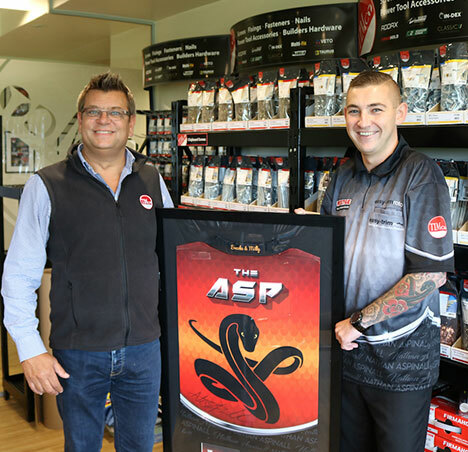 On Monday 17th September, Professional darts player, Nathan Aspinall, paid a visit to the TIMco offices where he presented a signed shirt and gave the TIMco team an insight into his professional darts skills first-hand. Nathan wanted to say thank you to TIMco for the sponsorship he received that helped him compete at the highest level throughout the year and also for their ongoing support. TIMco has proudly sponsored Nathan for the past year, having been first introduced by his manager and promoter, Martin Foulds, who is also the owner of Prestige Building Supplies, Rochdale, one of TIMco’s UK stockists. How did you get into darts? You’ve just claimed your first PDC ranking title – a fantastic achievement! It must be quite overwhelming to suddenly find yourself surrounded by top players. How have you coped with the shift, psychologically? Do you always use the same darts? Do you have a specific ritual you do before you play an important game? How has TIMco’s sponsorship helped you? TIMco is head quartered in Nantwich, Cheshire and imports and supplies more than 6,500 product lines from around the world to distributors throughout the UK, Ireland and Europe. The company was established in 1970 and now employs 150+ members of staff from its offices in the UK, Ireland and Taiwan. For more information, visit www.TIMco.co.uk.